Eat your way through Ho Chi Minh City - formerly Saigon - and taste the best street food at night! Meet your English-speaking guide at 05:30 pm, and climb on the back of a bike to immerse yourself in the crazy traffic. Join thousands of other motorbikes as you ride the streets and your driver takes you through notable neighborhoods, including District 3 where the locals live. Stop to enjoy some Banh Xeo and Banh Khot (South and Central rice pancakes), and learn how they are made from a chef with over 20 years experience before riding down hidden alleyways, where you will encounter old apartment buildings. Go on a short adventure to climb up to the top of some old buildings and see the contrasting architecture between modern and authentic Saigon. You can even visit a local pagoda which was built inside an old apartment by a female monk. Visit the biggest night flower market and soak up the wonderful bouquets. Take a short walk around the area, and get a special gift from your guide. Go deep into a true maze of local market to have an authentic local experience by grilling banana girdle- cakes. Next, drive to District 5 and pass a street famous for its oil paintings. Stop at a local restaurant to savor some bún chả (grilled pork with noodles, Hanoi style), known as “Obama Noodles” after President Obama and Anthony Bourdain tried them in 2016! End your food and motorbike tour in District 4, where you will enjoy a seafood meal of 3 different dishes and an authentic food challenge! (if you are allergic to seafood, it will be replaced by BBQ meat). Try some balut (boiled, fertilized egg) if you dare, and tuck into a nice dessert of flan cake with caramel, coffee and coconut milk. Wash it all down with some special beer, soft drinks, mineral water or homemade Vietnamese rice wine which is made in Street Food Man Vinny's village. 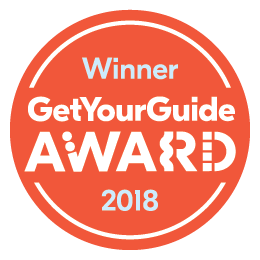 ***Good News: Ho Chi Minh City Food by Night-Private Motorbike Tour just won the Winner Award 2018 In Asia from Getyourguide for Incredible Culinary Experiences.